Brewing with Salt Lake City’s own Squatter’s Pub for over 17 years, Jenny Talley has literally worked her way from the ground up. “I came on for $4.75/hour, scrubbing the floors, assistant to Dan Burick, the brewmaster at the UBC [Utah Brewers Cooperative],” Talley says. After only five years, Talley’s hard work paid off when she was promoted to brewmaster for Squatter’s Pub as well as the Director of Research and Development for the Squatter’s brand. Since that promotion in 1996, she has been involved in the medaling of numerous brewing competitions—14 in total. The most recent of these was at the 2008 World Beer Cup, where she and her brewing team, solely consisting of Jason Stock, received a gold for their Alt and in the Way in the category of German-Style Brown Ale/Düsseldorf-Style Altbier (to be released sometime this fall). A farmhouse ale falls into the basic classification of a Belgian beer. This beer is unique because of the brewing process; it is not something just thrown together in a matter of weeks, instead it takes months of labor and skilled artisanship. Broken down into a series of fermentations that require a re-pitching of multiple yeast strains, the traditional farmhouse begins its brewing process in the winter months, and is ready to be consumed by the following summer. A very complex beer in aromatics and taste, this Belgian-style beer gives off a light tartness with some spice and touches of bitterness. They have quite a dry taste, due to the yeast used in the final stages of brewing. 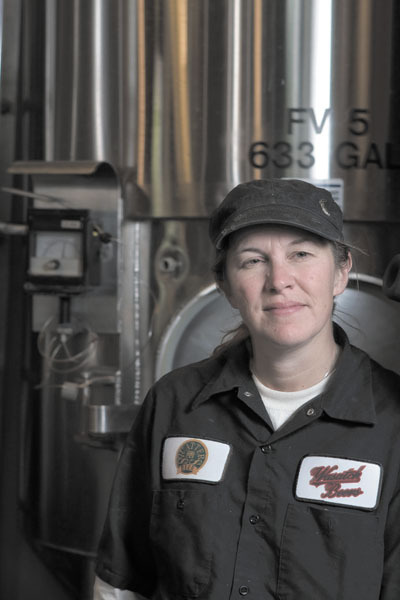 Talley began the initial brewing process in December of 2007 when she brought in a yeast strain for propagation. This specialty saison yeast (similar to wine yeast) was, according to Talley, “The most difficult yeast I have used in my life.” By selecting this particular yeast strain, Talley hoped to achieve the certain saison characteristics that will act as a base layer for Fifth Element. Once the initial fermentation was completed earlier this winter, Talley pitched a lager yeast and fermented the rest of the brew at colder temperatures hoping to make the conversion of sugars to alcohol easier. After this cold temperature fermentation was completed, Talley transferred the brew to oak barrels. “I brought in the oak around January. It came from Firestone Walker; it was used to ferment double barrel ale,” Talley says. Firestone Walker, a brewing company out of California, is well-known for its oak aging of beers. “I added a growler of New Belgium La Terrior to the fourth barrel before I put the beer in. La Terrior carries lactobacillus, pediococcus, and brettanomyces,” she says. The addition of these microflora and wild yeast strains will sour the farmhouse ale to achieve certain potent characteristics that keep it true to its style. It was added into just one oak barrel, in a process known as “souring a barrel,” while the other three barrels were left untouched with the hope that these wild yeast strains will latch onto the other barrels, giving them a more natural fermentation. When this fermentation is complete, and the correct amount of sugars has been converted to alcohol, it is time to bottle. At that point, they will once again add a calculated amount of yeast. “I will pitch some dextrose [corn sugar], and some champagne yeast,” Talley says, “Champagne is flavor neutral, and knows what to do in a bottle.” With this yeast strain becoming active in the bottle, it will give her the super high carbonation characteristic she wishes to achieve. As the brew is still in the process of being bottled and released to Squatters Pub and The Bayou, it ought to have enough time to age in the bottle. This brew will be hard to miss as it is poured out of a brown champagne bottle and is projected to costs around $12 due to the long process of production. As to not discredit those that spent many hours laboring over this brew, Talley wanted to mention, “The entire Utah Brewers Cooperative team have been, and continue to be, an amazing help every step of the way.” With that respectful attitude, Squatters is, and always will be, one of Utah’s frontrunners in the brewing industry. And the release of their Fifth Element, will only launch them to a new level of popularity with the public and brew lovers statewide. Without the public embarking upon these newer brews, they may cease to be made.